Rahu resides in his own idol. Thirunageshwaram is one of the 127 temples on the southern banks of river Cauvery. It is one of the Panchakrosa Sthalas. The presiding Deity is Arulmigu Giri Gujambika Sametha Naganathaswamy. The Raaghu Sannathi (Nagaraja Shrine) is on the South-West direction of the second prakara. ThiruJnana Sambandar, Thiru navukarasu Nayanar, ThiruSundramoorthi Nayanar, and Arunagiri Swamigal have praised the glory of the Lord. The Thirunagechurappuranam which was written by Singaravelu pillai contains sufficient information about the temple. This temple is considered most sanctified by its presiding deity ( Moorthy ) location ( sthalam ) and sacred water ( theertham ) , and most benevolent because Saiva saints Thirugnana sambanda Swamigal , Thirunavukkarasu Swamigal and Thiru Sundaramoorthy Swamigal have sung in praise of lord siva here, besides being the most worshipful place of legendary fame Saiva saint Sri Sekkizar swamigal who brought out the sacred Saiva text ' Peria Puranam '. This place is one of the 127 worthy places of divine worship spread over the southern bank of River Cauveri . Among the nine worship places, for the nine planets, Thirunageswaram is the place where Raaghu Bagavan is obviously active to bestow his grace. Here Raaghu Bagavan can be seen with his two consorts Nagavalli and Nagakanni together, prayers for fulfillment of desires at this shrine are favorably answered with success. This temple is one where Lord Siva was worshipped by Raaghu Bagavan and got relived of a curse . 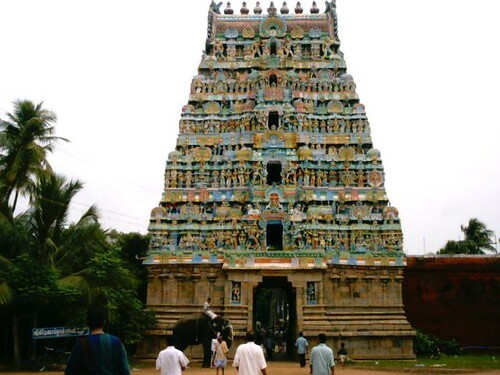 Thirunageswaram temple is 6kms from Kumbakonam on the Kumbakonam - Karaikal bus route and by train, there is Thirunageswaram Railway Station between Mailaduthurai and Kumbakonam and the temple is 1km.on the south. Poudiga Purana contains the fact that Lord siva once told his consort Umadevi about Shenbagaraniyam , now called Thirunageswaram and its renown. Among the nine worship places, for the nine planets, Thirunageswaram is the place where Raaghu Bagavan is obviously active to bestow his grace. Here Raaghu Bagavan can be seen with his two consorts Nagavalli and Nagakanni together, prayers for fulfillment of desires at this shrine are favorably answered with success. This temple is one where Lord Siva was worshipped by Raaghu Bagavan and got relived of a curse. In this temple only we can see the Raaghu Bagavan with human face. All of the places we can see the Raaghu with Serpent Face. Thirunageswaram is known as Raaghu Bagavan ( Raaghusthalam ) place among the Nine planetary situations. As per Astrological system , by doing Milk abisekam here for Raaghu during Raaghu kalam (period of 1and 1/2 hours occurring every day ) the delay in getting married; childlessness, trouble some married life, ill-effects of Kalasarpa Dhosha (affliction), Kalasthra Dhosha , Sarpa Dhosha are all cured. The MILK while being over poured over the idol, turns BLUE even today and it is really to be seen, to be believed . People from far and near throng here for performing MILK Abhisekam and the number is ever increasing. It should be given kept already in one's life to be lucky to visit this shrine, says Appar Swamigal ( Navukkarasar ) in one of his rhymes ( Thevaram ) . If people born in stars ' Rohini ' and ' Aayilyam ' perform Abhisekam etc. for Sri Naganatha swami, they can get cured of bodily ailment and he healthy. Raaghu Bagavan , is founds in 3rd ,6th and 11th houses from Lagna or in 9th or 10th place at the time of birth according to the horoscope there will be good effect. But if Raaghu Bagavan is found in 2nd ,5th , 7th or 8th place from Lagna it indicates Raaghudhosha (ill-effects) . Raaghu Bagavan generally can be said to be the cause for one's good position, status, business, faithfulness, winning over opposition, to be dept-free, to travel over seas, and for mantra power . This magnificent Temple is Situated 7 km east of Kumbakonam, in Tanjore District,Tamil Nadu.